In the fourth pAsuram, AzhwAr says “If there are hurdles, you should mercifully eliminate them and appear in front of me to remove my sorrow”. emperumAn says “Don’t grieve; though I can eliminate your sorrow, the hurdles are huge”; AzhwAr responds “Oh! Is my hurdle greater than SakatAsura?” AzhwAr says “as soon as they (hurdles) see your foot, will they not run away?”. The hurdles think “What will happen if the feet touch us?”, and run away as said in periyAzhwAr thirumozhi 5.4.3 “summenAdhE kaivittOdum” (will run away being unable to breathe). piLandhu vIyath thirukkAl ANda perumAnE! vArAy – you should appear! Oh lord who engaged your divine foot to make SakatAsura’s body lose its form by losing firmness, splitting it into two to become different pieces and to break it! Just as you appeared manifesting the splendour to be surrounded and worshipped by brahmA, rudhra, indhra and dhEvas, you should appear on the sky one day to be seen [by me]! thaLarndhum … – To finish SakatAsura eliminating the firmness of his body, to split it and to turn it into pieces; SrI rAmAyaNam yudhdha kANdam 94.22 “chinnam binnam Sarair dhagdham prabagnam Sasthra pIditham” (They saw the army of rAkshasas who were cut, blown away, burnt and destroyed by the arrows of SrI rAma). Subsequently disappearing to not even be able to see the particles. While he could have simply said “SakatAsura was destroyed”, he is saying “thaLarndhum”, “muRindhum” etc individually since he relishes the destruction of the enemies and each of those steps is sweet for him. thirukkAl ANda – If the servitors (divine feet) are engaged, they will help when in danger. AzhwAr is saying “While he [chEthana, sentient entity] remained silent due to his infancy, it was the divine feet which protected us!”. 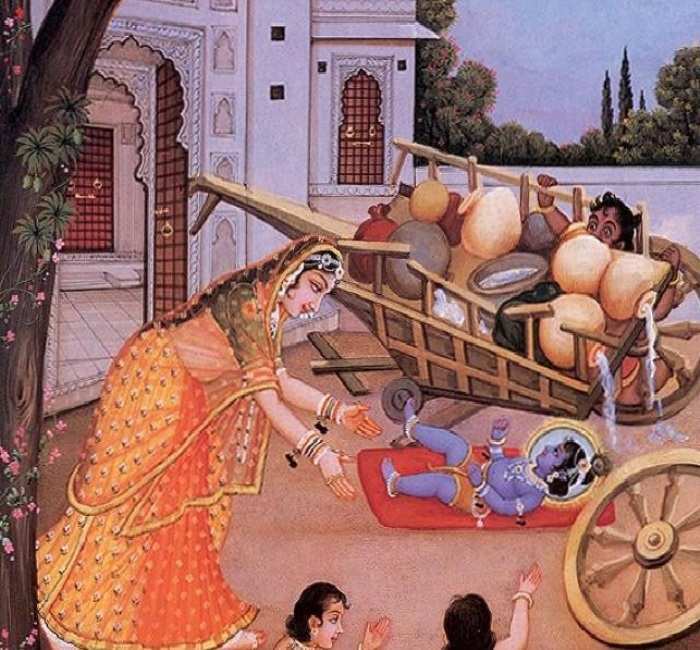 As said in SrIvishNu purANam 5.6.1 “sthanyArthI brarurOdhaha” (desiring for mother’s milk, he cried and lifted his feet), out of anger in not getting fed by his mother with her milk, he [krishNa] lifted his divine feet; at that time, the wheel [came in contact with the divine feet and] turned into pieces; as said in periya thirumozhi 10.8.3 “uruLachchagadam adhu uRakkil nimirththIr“, he did not do it intentionally either. While knowingly engaging [in destroying the enemies], his divine weapons will help; if those are not there, his own hands will help; even if his hands are not helping, at that stage, the divine feet will come to the rescue. Not only for our dangers, even for his own danger, only his feet help him. As his divine form exists for his devotees, it remains the cause to eliminate their hurdles too. perumAnE – For you [emperumAn’s divine feet] who protected the lord back then, is it a huge task to protect the servitor? As he is the prakAri (entity), the attributes will survive too. kiLarndhu … – AzhwAr is praying to emperumAn – being surrounded by ananyaprayOjanas (those who desire benefits other than emperumAn himself) who are said to be as mentioned in thiruvAimozhi 3.5.4 “kumbidu nattam ittAdi” (dancing up and down), being not in control of self, entities such as brahmA, rudhra, dhEvathAs et al, irrespective of superiority/inferiority, like a water body which surrounds everything, and like a lamp in darkness as said in SrIvishNu purANam 1.9.67 “thEjasAm rASimUrjitham” (collection of radiance); with such radiant form, like you appeared for the elephant, you should appear covering the whole sky. viLanga – In his presence, the radiance of brahmA, rudhra et al, is like darkness. oru nAL – Did I pray for hundred years or thousand years! kANa vArAy – Is he thinking that I am saying “nIL nagar nIL eri vaiththaruLAy“! viN mIdhE – Did I ask you to descend to earth? This entry was posted in thiruvAimozhi, thiruvAimozhi 6th centum on June 3, 2018 by Sarathy Thothathri.